Talking about Hoi An (Hội An) is referring to one of the most prosperous trading seaports in the world during the 16th and 17th Century. That gave Hoi chances to strongly develop. By the time, more and more people stayed here and built up their lives. An extremely crowded town was then formed at that time, which left us hundreds of old houses standing up to now, which has been treated as a world cultural heritage. The reason why Hoi An Ancient Houses has dug into tourists’ heart for many years is thanks to the beauty of the classic. Especially, antique architecture leaves us various things to discover. People often say that coming to Hoi An without visiting its old houses would be a big pity because you could not deeply understand how Hoi An is. In this article, we suggest the most famous Hoi An Ancient Houses that you can put in your list of activities to do in this peaceful town. 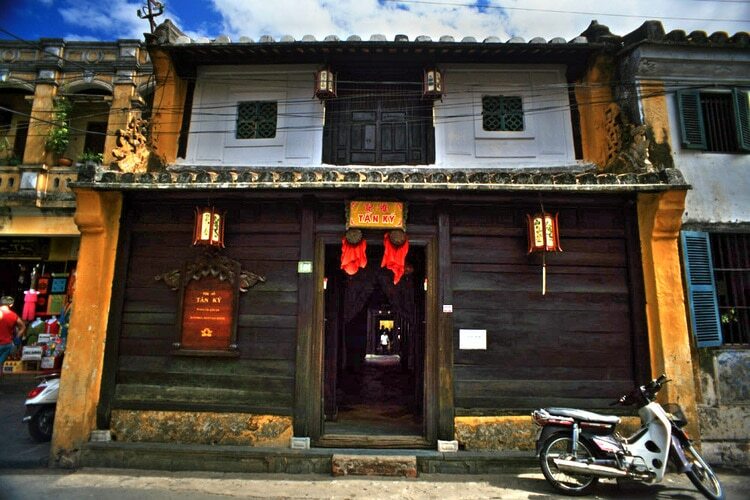 The first name appearing in your list should be Tan Ky Ancient House (Tấn Ký) with more than 200 years old. It was built in 1741 and experienced through seven generations of Le family. Tan Ky was named to the house in order to get good luck for the business. 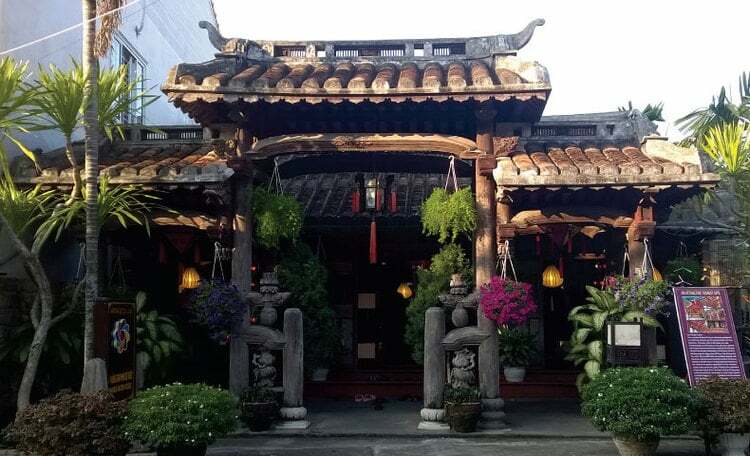 Normally, there are two facades in an ancient house in Hoi An Town. Tan Ky’s first facade is on Nguyen Thai Hoc street, which promotes the business. On the other facade, the house is toward the riverside, on Bach Dang street. This is convenient for goods import. To keep the house warm in winter and cool in summer, people used wood and Bat Trang tiles as the main materials for the house. It also creates the ancient beauty for heritage. A precious thing that makes Tan Ky become an attractive place is its original look. Tan Ky ancient house preserved many wontons and antique paintings. Especially, the most breath-taking and valuable works of art, including “Tích đức lưu tôn” (teaching children and grandchildren to keep good virtues); “Tâm thường thái” (keep your mind tranquil). That is the reason why Tan Ky Ancient house always welcomes a big number of visitors every year. It is very honor for Tan Ky House to be selected to be a National cultural heritage that has served domestic and international leaders and politicians many times, which makes Tan Ky extremely well-known to tourists. Not only Tan Ky but also Phung Hung (Phùng Hưng) is a highlight in the traveling schedule in Hoi An. Located in No.4, Nguyen Thi Minh Khai street, Phung Hung ancient house has been there for more than 100 years. Even though the house is a hundred years fewer than Tan Ky, it is still preserving the beauty of times. The unique structure along with the high wooden section and large corridors reveals the development in design and the combination of Asian architecture styles. Phung Hung ancient house is another symbolic image of Hoi An Town. If you visit Tan Ky and skip Phung Hung, you might catch a big pity. Visitors can have a look at both houses and see the differences in architecture by time. 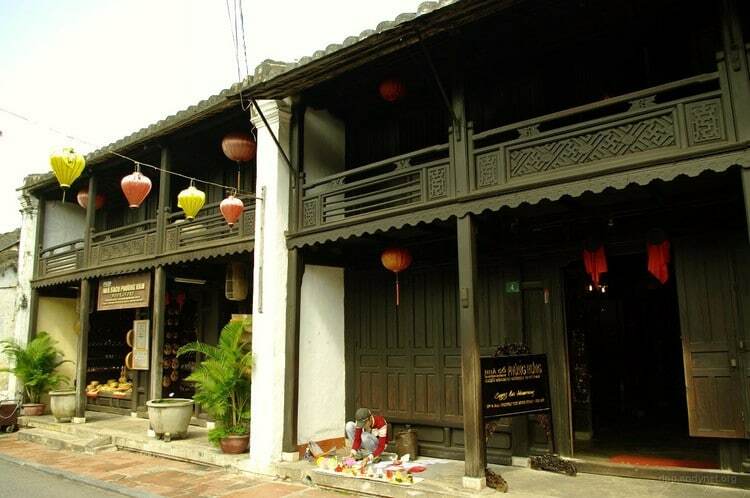 It is not overstated that ancient houses in Hoi An are considered as the houses of the past times. According to history, the first owner of the house is a Vietnamese businessman. The name Phung Hung represents prosperity, which is also his wish for a successful business. It is assessed to be one of the most impressive houses of the ancient Hoi An architecture. Up to now, the 8th generation is living in the house and preserve it carefully. The house possesses the typical design of the 19th century while Tan Ky house brings along the feature of 18th. The structure is tabular with a wide façade. Like Tan Ky and other ancient houses in the town, the main material is wood. It combines Vietnamese, Japanese, and Chinese design. The central roof called “tứ hải”, which has four directions, following Japanese style. The most impressive feature of the construction is that 80 wooden pillars of the house were all settled on the rock cornerstone in order to avoid the touch between the pillar and the ground. When visiting Tan Ky and Phung Hung – Hoi An Ancient Houses, you can enjoy “Bánh Mỳ Phượng” (Phuong Bread), which is located at No.2B, Phan Chau Trinh street. The bread is extremely famous to local people and a large number of tourists thanks to its unique taste and brand name. It is so cheap for bread here, about 10,000 to 15,000 VND; even though Bánh Mỳ Phượng is Hoi An’s a specialty. Besides, you can taste some local food and sweets alongside the river. Especially, you can eat “Mỳ Quảng” and “Chè” and can find local food anywhere. Hope you enjoy Hoi An in your own way. To know more about Vietnam travel, visit our Vina homepage. Let’s share with us your trip when you reach Hoi An Ancient Houses!